You will only deal with very experienced and capable people. Our team consists of highly qualified professionals with years of experience in the property industry. There is too much at stake to have it any other way. No one will be practising on you or your property. You benefit from our use of the latest technology systems. The world has changed and our state of the art systems allow you access to what is going on with your property anytime, anywhere. Our system also allows us to get things done quickly and properly. Our Property Management team are very focussed on finding and keeping the best tenants for you. We closely monitor the rental market so we are in the best place to advise you on demand and rental levels. We focus on investment property in Melbourne. We have built our careers in Melbourne and know it inside and out. You can trust our expert knowledge of selling and managing property and what makes a great investment in our city. Selling or buying and investment apartment is a crucial decision and a complex process with lots of market noise and conflicting views. Fortunately we have done it for over 20 years and managed over $4 billion of sales so we can definitely guide you in the best way. We discuss your market and key investment decisions. There is a lot of market noise. You need to know what’s happening to your property. We will regularly discuss with you current and specific market data so its meaningful and helpful to you. We are a fourth generation real estate family. 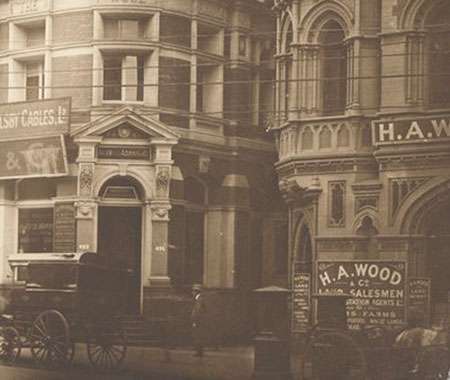 “My great grandfather, Henry Wood, had a real estate office in the old Rialto Building in Collins Street, Melbourne in the early 1900's and after four generations my family has continually provided real estate service.” – Andrew Wood, Managing Director, Wood Property Partners. You get connected to our specialist partners in related fields. We work closely with you and provide access to our network of preferred advisor partners for professional services such as; tax, legal, finance, insurance or financial planning. Our Director understands investment property. Wood Property Partners Director, Andrew Wood is former Managing Director of Jones Lang Lasalle, in Melbourne. He has managed billions of dollars in investment transactions, so he understands investment property and can help you make the right decisions. 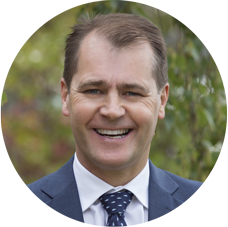 Andrew will be your personal property market advisor and will bring in specialists in areas such as tax, accounting, financial advice, legal, insurance, estate planning or foreign exchange as need be. Communication is key so we all know the plan and can work together to achieve a common goal. (Please note: Any personal, sensitive, financial or legal information can remain confidential with your adviser). Kelly heads our property management team. She is loved by her clients who have got to know her over her 10 years of experience, covering all aspects of Property Management. Kelly possesses a strong work ethic, Property Management certification, and combines this with a hard but fair approach to property management to ensure she works diligently for all clients. I grew up in a real estate family. It was the business that provided everything we had and it was all we talked about. Each day brought new real estate related tales and adventures shared around the family dinner table. I never met my great grandfather, Henry Ashton (Harry) Wood. He died well before I was born. That’s him on the left of the photo. This shot was taken in 1918 and my grandfather Henry Raymond (Ray) Wood, a strapping 19 year old (and excellent ‘tap’ ruckman from all reports) is on the far right. The real estate office was fairly basic with dirt floors and hessian walls. 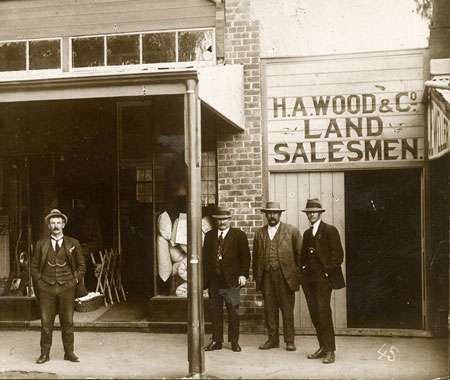 Harry Wood didn’t struggle for long and set up an office in Collins Street Melbourne in the 1920’s in the old Rialto Building. You will see their office in the bottom right of the photo below. To this day that photo is etched in a plaque on the building which is now the entrance to the Inter Continental Hotel. By the 1930’s the great depression would hit, and young Ray’s business baptism would begin. My Dad, Henry William (Bill) Wood, who joined the business in the early 1950s, says his father was an exceptional businessman who steered the company through many tough economic times. Bill is a gifted marketer, auctioneer and negotiator and there was always a deal in the wind or an interesting property challenge he would share with us. He continued to grow the business during his 40 years at the helm and co-founded First National Network of Real Estate Agents which now has over 400 agents across Australia, New Zealand, and South Pacific. I’m the 4th born of 5 boys and 4 of us work in real estate. In 2008, the family business of Wood & Co celebrated 100 years in business and today, the company thrives under the leadership of my brother Brian and his wife Lauren.